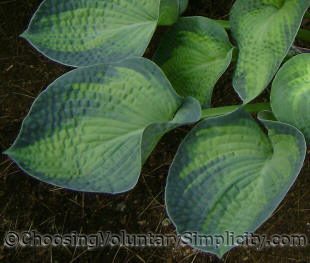 The Tokudama Aureonebulosa hosta has chartreuse leaves and wide, blue-green margins. In sunnier areas, the chartreuse becomes more golden. The thick leaves are cupped and very corrugated. This slow-growing hosta has dense clusters of flowers that bloom in early July and produces many seed pods. I have had interesting results with Tokudama Aureonebulosa seedlings… a few have been variegated, but most have been gold or blue, and all have thick, corrugated leaves and grow very slowly. My husband found this hosta in a local nursery and bought it for me because he recognized the name as one I had wanted, but it wasn’t in a very good condition and had a very small root system. It has taken several years for it to take hold and finally begin to thrive. You have so many lovely hostas. 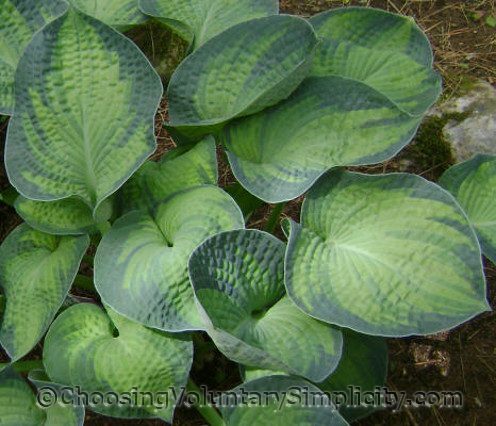 Thank you for sharing these beautiful photographs and hosta information. 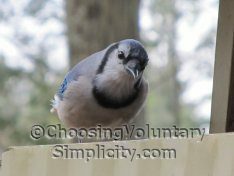 I have found both to be most helpful. I too have found this hosta to be very slow growing. I also have the other one in this group (can’t remember the name right now) and that seems to me to be rather more robust than this one. I hope someday to have mine be as lovely as these photographs. Thanks for sharing your life with us. Very very nice! I like the nubby look that this one has. Also the muted blue and the green. Great job with this blog. I am a regular reader.